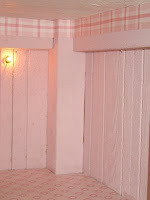 Another great way to make borders for your dollhouse is using scrapbooking paper. Cut thin strips, measure, and glue! Here is an example (not actually a small enough print in my opionion, but it was what we had at the time).